Global Mahjong Tournaments are four-hour-long events, held every Saturday, that offer Mahjong Time members a chance to be ranked against each other in an official competitive environment. 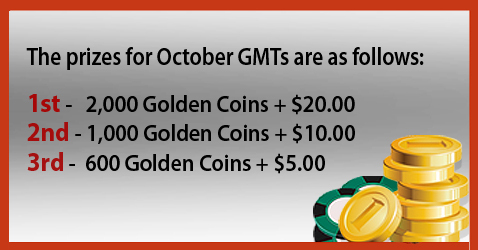 The GMT entry fee is only 100 Golden Coins ($1), and the prize pool is 1800 Golden Coins! These events are played every Saturday, and cycle through Hong Kong, MCR, Taiwanese, MJMP and Riichi styles.